Got Mold While Renting: Who is Responsible? Mold is an issue nobody wants to deal with, but unfortunately it is a ubiquitous microorganism. There are many ways to get rid of mold and even prevent it if we take the necessary precautions, but we usually do not begin to panic until we see start noticing that greenish gray fuzz creeping on the walls and ceilings of our home. Now here is something to think about, when we are renting a home, who should be held responsible for taking care of this overbearing issue? Should it be us, the people living in the home, or the person who owns it? To begin with, it should not be a question if the mold had been there before someone moved into a certain property. A landlord should not be able to rent out a house or apartment unless it is clean and free of mold. However, if mold began appearing right after a tenant moved in and it is suspected that it had been there before, it should also be spoken about to the landlord and he or she should be held liable. But what if mold started appearing after someone moved into a property? Logic may say that if mold begins to appear because of failure of a tenant to clean properly or take the necessary precautions to prevent mold from forming, it should be the responsibility of the tenant, or the one renting to take care of the issue. It is common courtesy that one takes responsibility for their actions, and any ethical person should agree to that. However, people continuously win cases against their landlords after picking up a disease caused by mold, and they often win a lot of money doing so. Does that mean a landlord should just always make him/herself accountable to issues regarding mold out of precaution? What are the legal standards and who is held accountable legally? To begin with, a landlord and tenant must always discuss this issue pertaining the tenant actually moving in to the home. Mold is a big issue in America and it should always be stated in a contract who should be responsible for mold that develops, especially if a tenant is staying in a property for a long period of time. So, if a landlord clearly states that he or she does not wish to be responsible for issues regarding mold, and the landlord and tenant can come to compromise and agree on whatever works for both of them. In that case, a landlord may be able to get away with being held accountable for mold. However, in most cases, especially if this issue is not discussed in the contract, a landlord will almost always be held accountable for issues related to mold. Also, if a landlord wants to have a piece of mind and not be involved with lawsuits in the case that someone is harmed because of the mold, he or she should just always take care of that matter. With that being said, every state has a certain standard to how much mold a landlord should be held accountable for, and what the charges may be. In the state of Texas, there are no laws that state that a landlord is responsible for mold issues in a home while a tenant is renting. However, a tenant may complain if certain harm is caused on anyone’s health and if able to prove that the landlord was negligent towards the issue or caused the mold, the landlord may end up paying a lot of money in return. A tenant may also practice ‘rent withholding’ which means that a tenant may legally refuse to pay rent in a home until mold is fixed if they believe that the mold is causing the home to be ‘inhabitable’. Legally, a landlord must provide a habitable area to live in if a tenant is paying rent. Also, a tenant may legally use the ‘repair and deduct’ method which means that if a landlord is refusing to solve the problem, a tenant can solve it then deduct the amount used from the rent. This may not work however in Texas, as the landlord should not be held accountable. But, many landlords agree to this as they would not want to be subject to being sued if mold caused health complications for the tenant in the future. 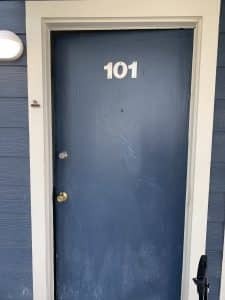 So even though a landlord is not subject to responsibility of mold issues, they can be sued for neglecting the issue in Texas if harm is caused. This means that a landlord should just take care of the matter to begin with, unless they are willing to take on a case which, who knows, a lawyer might be able to win! It is a risky matter at the end of the day, but the law cannot force the landlord (in Texas at least) to take care of the situation. Just like the laws in Texas, there are no laws (federal or state laws) that force a landlord to take care of mold in a property. However, the law in North Carolina imposes that a landlord fixes any problems with excessive water in a house/apartment, sewage issues and flooding problems caused be leakage that may lead to mold. So, if those issues were not solved and mold was caused as a result, a tenant may press legal charges against a landlord in court. However, if mold was caused for any other reason, a landlord is not held accountable. But again, as the situation is in Texas or any other state, health complications may arise from mold and a tenant may press charges and possibly win a case of that sort. So the safe way to deal with mold for a landlord is just take care of it, or state otherwise in a contract and make things clear with a tenant from the beginning.